When I think back over the reindeer that have been part of the herd over the years, one which sticks in my mind is Scout. This is probably in part because he was on my “team” the first time I went off on Christmas tour. It was back in 2010, and as I headed off for my first two-week festive reindeer experience with Fiona, those six reindeer made a bit of an impact: experienced old boys Shekel and Shock (or Shockel and Sheck as we sometimes called them if we hadn’t had enough coffee! ); Scout and Hughie, our younger Christmas reindeer; and calves Lace and Gnat. When you’re working, living and travelling with the same team for a fortnight you get to know their quirks rather well! 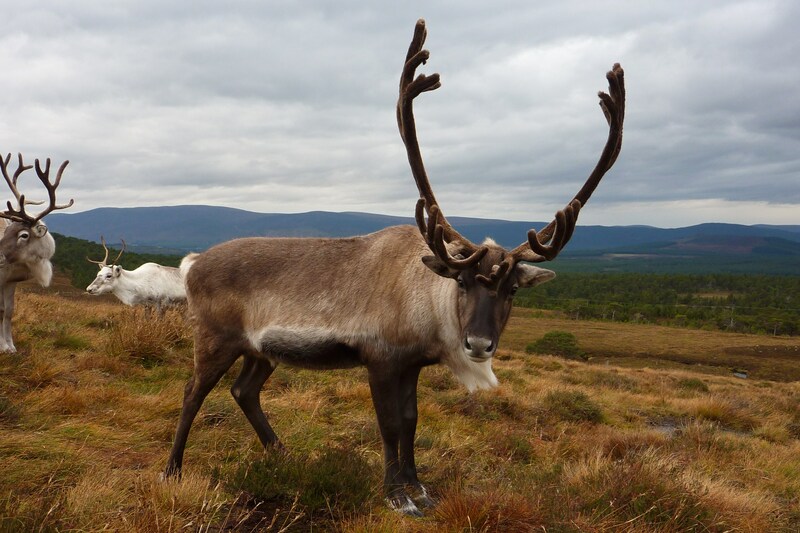 Born in our “Green theme” year, Scout was a big reindeer (so big in fact that we castrated him at 2 years old instead of at 3), one of the tallest in the herd, and a fine looking fellow. He grew some beautiful sets of antlers, with lots of “fingers” coming off them. 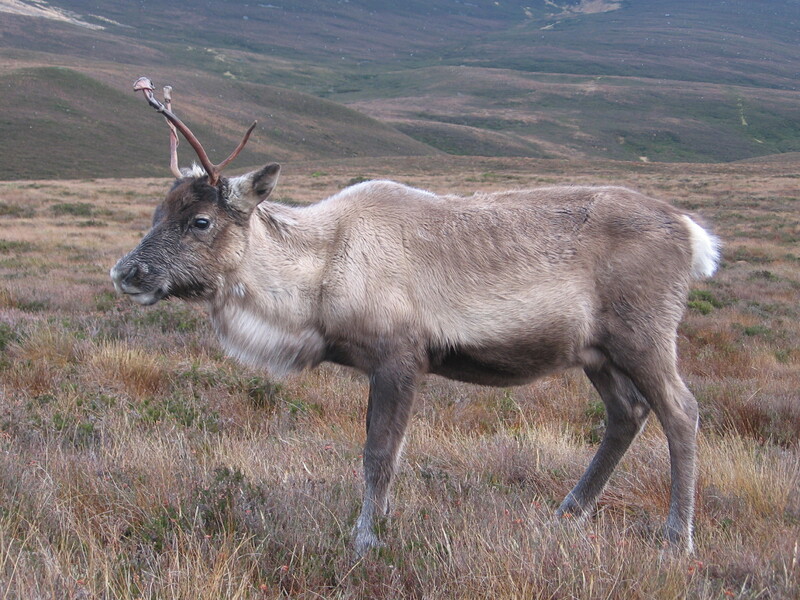 He was generally also holding almost too much condition, with a generous sized belly, and with this excess of energy he often had bobbles of extra velvet on his antlers, something we only tend to see in our larger (wider!) males. My main memory of Scout from that Christmas tour is when we arrived at an event in London, set out the feed bowls ready for their breakfast, and Fiona hopped in to the truck through the (human-sized) side door, assuming I would latch it behind her. I meanwhile assumed she was going to latch it herself from the inside (the hazards of having been on tour long enough to stop communicating about everything and make presumptions). Alas, the door didn’t get secured at all and the next thing we knew Scout had squeezed his antlers and ample belly through, bounded down and of course made a beeline for his breakfast! At least he was easy to catch! I also have a vivid memory from a more recent Christmas of taking part in an incredibly busy parade in England, and looking back from where I was leading the front two reindeer – Scout was one of the reindeer following on at the back and he was utterly at ease, chewing the cud as we pottered along, not batting an eyelid at the noise, lights, marching band, fake snow and bubble machines that we were passing. Reindeer really are incredible animals. Scout was a dependable fellow out on tour, whether at the back or front of the sleigh, and was a friendly face at home on the hill, though he did have a grumpy streak at times, doubtless inherited from his father Sirkas, who certainly could have an attitude problem! Most of the time though he was lovely to be around, a bit cheeky and playful, and steady as a rock. His brothers included dark coloured Rummy, squinty-nosed Boris and the infamous Fergus. Scout’s grandmother, Fionn, lived to the ripe old age of 16, and her sister was Lilac, the reindeer who holds our record for longevity at 19. 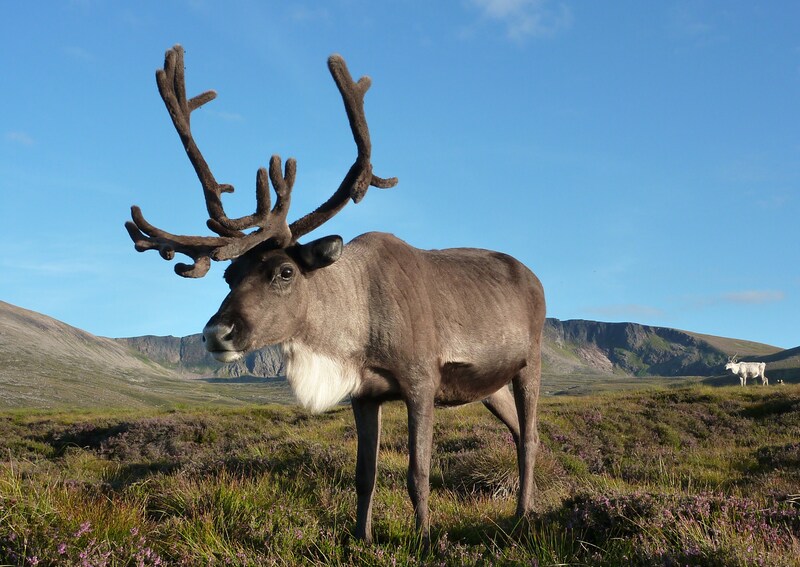 Unfortunately Scout didn’t live to quite such an age, but there are still many of his family alive, including two of our other biggest reindeer, Fly and Paintpot, who share the same father.